The Panel 1 Tests segment is expected to expand at 10.8% CAGR over the forecast period and be valued at more than US$ 850 Mn by 2024 end. This segment was estimated to account for more than 50% revenue share of the global non-invasive prenatal testing market by 2016 end. Panel 1 Tests segment is projected to create absolute $ opportunity of more than US$ 40 Mn in 2017 over 2016. Revenue from this segment in the global non-invasive prenatal testing market is expected to grow 2.3x by 2024 end as compared to that in 2016. The Panel 2 Tests segment is expected to record absolute $ opportunity of close to US$ 19 Mn in 2017 over 2016. The Panel 2 Tests segment is estimated to register 9.7% CAGR over the forecast period. This segment is expected to lose a little more than 90 BPS in its market share by 2024 end. 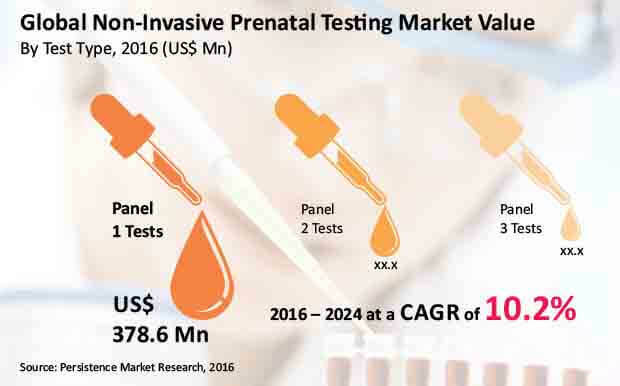 The Panel 3 Tests segment revenue in the global non-invasive prenatal testing market is expected to grow 1.9x by 2024 end as compared to that in 2016. The Panel 3 Tests segment is anticipated to expand at 8.6% CAGR over the forecast period and be valued at more than US$ 200 Mn by 2024 end. This segment is expected to lose more than 180 BPS in its market share by 2024 end. Leading market players in the global non-invasive prenatal testing market are introducing innovative tests to differentiate themselves from one another in a competitive market. According to a review article published in the British Medical Journal in 2016, the sensitivity of tests for Down Syndrome was 99.3%, 97.4% for Edwards and 97.4% for Patau Syndrome. The specificity of all three tests was 99.9%. Use of emerging technology platforms such as next-generation massively parallel sequencing has incentivized vendors to develop more sensitive tests for better results. This particular factor is fueling the growth of the test segment of the global non-invasive prenatal testing market. Several laboratories and companies have signed distribution agreements with test providers to be able to offer advanced products and services to patients, which is creating a positive impact on the test segment of the global non-invasive prenatal testing market. Several public health agencies of major countries around the globe have either started to, or are expected to offer these tests directly. This is further driving the adoption and revenue growth of the test segment as awareness of these procedures is expected to increase amongst the global population. Increasing awareness regarding non-invasive prenatal testing across geographies is expected to boost the revenue growth of the test type segment over the forecast period. For instance, obstetricians are increasingly recommending patients to undergo non-invasive tests as an alternative to invasive methods and for initial diagnostic screening in the first trimester of pregnancy. The Panel 1 Tests segment dominated the North America non-invasive prenatal testing market in terms of revenue in 2015 and the trend is projected to grow throughout the forecast period. Panel 1 Tests segment is the most attractive segment in the North America non-invasive prenatal testing market, with a market attractiveness index of 1.6 over the forecast period. Focus on improving technology and alliances and partnerships among key market players across North America is a major factor fueling the growth of the test type segment. In Latin America, government initiative and established healthcare infrastructure and partnerships are creating a positive impact on the overall test type segment. The high adoption rate of non-invasive prenatal tests is a major factor driving market growth in the APAC region particularly in countries like China, Australia and New Zealand. Advanced maternal age and high-risk pregnancies in China are estimated to be three times as compared to the U.S., and this factor is creating lucrative opportunities for the introduction of non-invasive prenatal tests in the Asia Pacific region.